eHelp Association has just officially launched the online reporting and help-seeking mechanism. The public can report online safety cases with related to child sexual abuse material, cybercrime and cyberbullying to our online platform. We will then coordinate with government departments, welfare organisations, social media platforms or Internet service providers for follow-up actions. 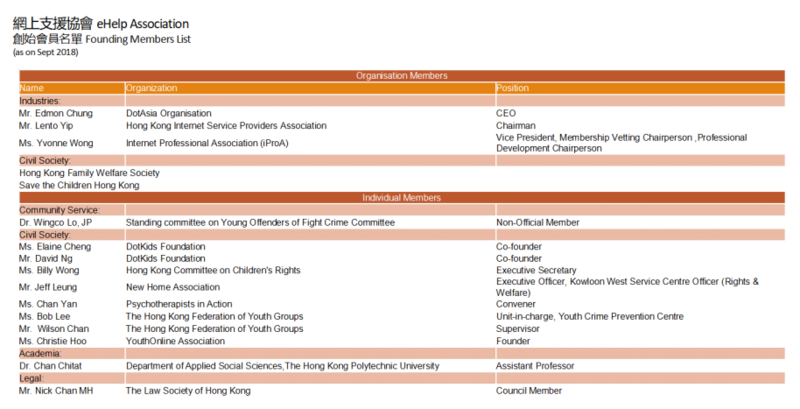 During the launching ceremony on 29 Sep 2018, we are grateful to have invited representatives from Save the Children Hong Kong, The Hong Kong Federation of Youth Groups, Hong Kong Internet Service Providers Association, DotAsia Organisation and The Law Society of Hong Kong participating in a multi-stakeholder roundtable discussion. While there are various challenges and possible traps children and young people may come across in the even-changing cyberspace, for example online streaming on social media has become a trend among teenagers recently, the discussion has covered a crucial point of exploring how parents can make a balance between ensuring the freedom of the next generation and providing sufficient protection for them. Speakers have highlighted the importance that on one hand everyone should get to know the up-to-date technology, on the other hand, parents should accompany with their children as a companion to tackle the challenges together. At the same time, it is encouraged to report the related cases to our platform, which we may create a better online safety net with and for children and youth. Copyright © eHelp Association. All Rights Reserved.